I’m having such fun working on the Sugarcreek Secrets Amish Mysteries series for Guideposts. But I’ll admit, getting the hang of the collaboration process has been interesting. I’m used to writing a story and having all elements be things that come from MY imagination. So trying to get used to working on a series where many of the details about the characters and their lives have been dreamed up by other authors (I’m responsible for book 6 and book 13 so far) has been challenging at times! However, having a new book in the series release just about monthly has been a great trade off, and I think readers are enjoying the series. Although it’s a mystery, there is definitely a romantic element that runs throughout. In fact, that’s an important element of the series! As I like to tell people who wrinkle their noses at how many times “love” is used in my book titles (Love is a Battlefield, Love is Monumental, Love Finds You in Charm. . .and so on) I believe every story is really a love story. This series is no exception. Cheryl Cooper and Levi Miller have painstakingly planned a special “Live Like the Amish” weekend for a group of senior citizens. The Miller family farm will serve as the perfect backdrop for the event, and they plan to give their guests and inside look at all things Amish–from buggies to fry pies and everything in between. It promises to be a relaxing time for all. . .until a pop star in disguise shows up and one of the grannies turns out to be a fugitive. And when the entire busload of people disappears before it reaches its destination, Cheryl realizes there’s more to being a tour operator than she bargained for. She and her friends scramble to locate the missing bus but are met at roadblocks at every turn. Can they figure out who is behind the vanishing vehicle before it’s too late? Or has it gone so far off the beaten path that it will never be found? 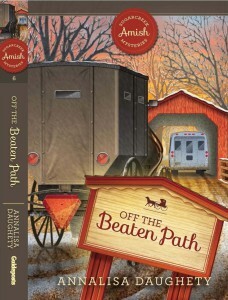 Click this link to check out the first four books in the series, and stay tuned next month when Off the Beaten Path releases! Wow, that does sound like a challenge, Annalisa. I have a hard enough time getting my own details organized, I can’t imagine dealing with other writer’s details. But you did it! Congratulations on your upcoming release. It sounds intriguing. This sounds like a fun book to write! I’ve written for Guideposts as well and yes, the collaboration is a bit tricky but it is also a lot of fun to be connected to other writers woking with the same characters and series and helping each other out. I enjoyed all of my work with Guideposts. Look forward to reading this story! This sounds like a fun book & a little quirky….my kind of read :-) I bet you’ll do it justice, Annalisa! Annalisa, I’m only now seeing this post and I am intrigued by your story and by the collaboration process. The Guidepost books are such gentle mysteries. This one sounds great.